The event, held on March 12, is the first symposium sponsored by the center. The symposium is meant to spread word “about work being done on issues of Latino/a equity, human rights and culture.” A full schedule is available here. The full-day event includes four panels focused on research and community engagement. Topics include: the advancement of Latino equity in Oregon, human rights in Guatemala, Latino history in Oregon and African heritage in Latin American popular culture. The panels are free and will be held in the Knight Library Browsing Room. Registration for the panels will begin at 8:45 a.m. 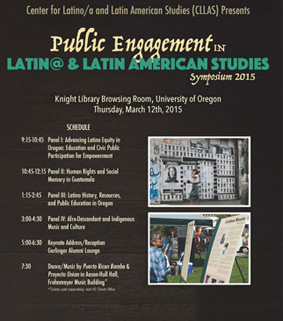 The symposium will also include talks from guest speakers Jean Franco, professor emerita at Columbia; Erasmo Gamboa, from the University of Washington; Marisol Berrios-Miranda, a Puerto Rican ethnomusicologist also from the University of Washington; and Alvaro Huerto from California State Polytechnic University. Dream Act activists Lizbeth Mateo and Marco Saavedra, who took part in civil disobedience in 2013 and were detained, will also speak. Finally, a musical performance of Puerto Rican bomba by Proyecto Union will close the symposium. The performance will begin at 7:30 p.m. in Aasen-Hull Hall of the Frohnmayer Music Building. Tickets to the performance are available at the UO ticket office or at the door.